The high school students have returned from winter break and are showcasing the hard work they have put in during their ‘time off’. Newington’s Ashanti Frazier and Plainville’s Bryan Buckley both had key roles in their respective teams wins over that stretch. The Newington girls basketball team rolled past New Britain 62-42 last Monday. The Indians like to think of themselves as defensive team first, but Frazier’s scoring abilities did not go unnoticed. During the second quarter of the game, Frazier herself went on a 7-0 run, helping the Indians outscore the Hurricanes 26-9. The sophomore guard ended the night with 23 points, including going 4-for-6 at the free throw line. The Plainville boys swimming and diving team was neck and neck with East Catholic last Tuesday afternoon. Without the diving portion of the meet, things could have gone differently for the Blue Devils. With the diving portion going in its favor, Plainville beat East Catholic 89-96. The Blue Devils sole diver was Buckley, who added six points to the final score for Plainville. Along with adding to the final score, Buckley qualified for states and scored a new record of 169.40. The senior captain was quite nervous when he found out he would be the only one performing from the Plainville side. The Blue Devils have two other divers but since they are new to the sport, they have not yet learned all the dives in order to compete. Besides making it to states, which he has done, one of Buckley’s main goals for this season is to make an impact on the team. 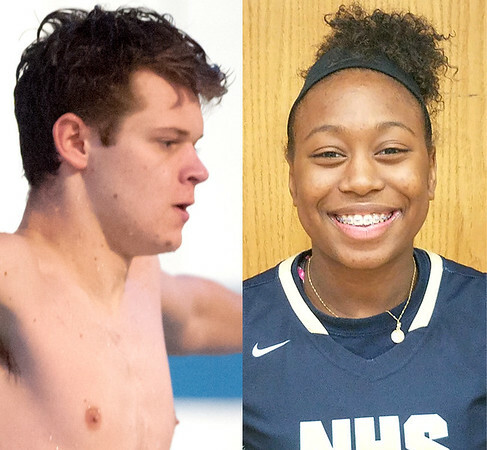 Posted in New Britain Herald, Athletes of the Week, Newington, Plainville on Monday, 15 January 2018 22:01. Updated: Monday, 15 January 2018 22:04.